A lot of investor attention this year has been focused on the so-called Emerging Markets, which represent less mature, developing economies. Here, we summarise our take on what has occurred so far this year, its impact on Netwealth portfolios and give our assessment for the future outlook. 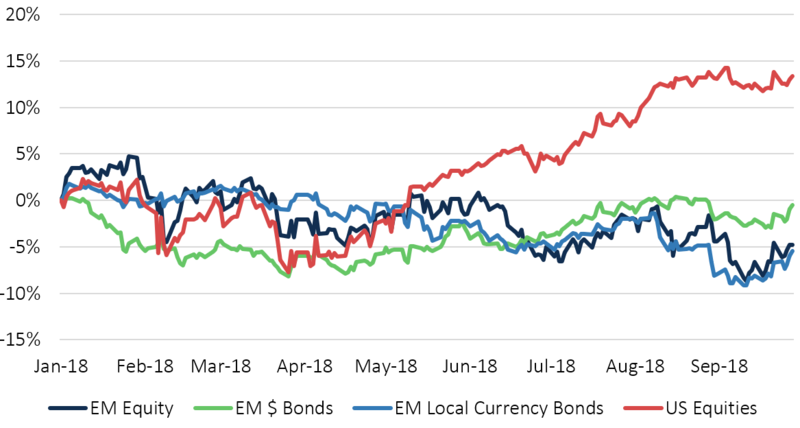 Our emerging market exposure has been a drag on portfolio returns this year, with selling pressure concentrated in the last three months. On portfolios invested in higher risk levels, this has been due to a blend of exposures from emerging market equities and debt, and has reduced portfolio returns by approximately 0-0.5%1 depending on the risk level. In any given year, some asset classes will do better than others, and emerging markets have indeed been an area of disappointment, but this year has been most notable for the extent of outperformance of US markets over all others. Softening domestic growth in some key countries in the summer months, the incremental pressure of gradual increases in US dollar funding rates and protectionist posturing from the US and China have exposed areas of weakness in certain international markets. Meanwhile, the strengthening dollar has done little to disrupt the solid expansion in the US, and its equity market has been driven higher by strong earnings momentum from key technology and consumer-oriented stocks. Chart illustrates total holding period returns for the 3 Emerging Market ETFs and 1 US Equity ETF held in various Netwealth portfolios denominated in GBP for the period to 29th September 2018. The majority of the bonds held are issued in US dollars by emerging market sovereign nations, so from this perspective the sterling portfolios have been helped by the dollar’s appreciation. Nevertheless, a smaller position is held in local currency bonds which have suffered from the depreciation of currencies, such as the Turkish lira and Argentine peso as well as from rising yields. Although these specific sovereigns have small direct weights, they have introduced an element of wariness about the broader spectrum of emerging market currencies. The regional exposure of portfolios’ equity allocation is more tilted towards Asia and has much lower exposure to ‘vulnerable’ countries with the challenging ‘twin’ deficits in their current accounts and fiscal balances as well as those that face political uncertainty. We take confidence from the decent macro-economic performance of most of the countries held, and in the underlying fundamentals of the companies which make up the index we invest in, which continue to offer solid earnings growth potential. On the macro side, growth has slowed across some of the major countries – a convergence with leading mature markets suggesting that companies which have less growth in which to participate will rightly dampen enthusiasm. However, talk of a renewed ‘crisis’ should be confined to the individual countries that have been in the news. In aggregate, although indicators such as manufacturing output have slowed from 2017 levels, recent data suggests we remain in expansionary territory. This should provide a level of support after a period of volatility. If you are interested in reading more, our chief economic strategist Gerard Lyons wrote an update on our thoughts on the macro environment for emerging markets here. Corporate earnings momentum has slowed in some key sectors of emerging markets compared to the strong performance of 2017. Importantly, cyclical sectors which are sensitive to the global trade environment have been impacted by a deceleration in global export volumes. However, our view is that the falls in valuation in emerging market stocks relative to those in the US is an over-reaction: they now trade at a significant discount to developed markets on major valuation metrics such as price-to-book and price-to-expected earnings ratios, despite being able to deliver a comparable return on equity. In relative terms, the US market’s earnings delivery has been stronger than we expected – despite the incremental domestic monetary tightening that has been so influential elsewhere. Macro performance remains resilient, but we believe that the fact that the US is so much further ahead in its economic cycle will start to be discounted by investors at some point. The chance of a major escalation of the Sino-US trade conflict is the caveat of all confidence in the near-term prospects for emerging markets. President Trump’s most recent announcements have unveiled 10% tariffs on an additional $200bn worth of Chinese imports, on top of the initial $50bn subject to 25% tariffs already announced. The tariff rate on the second phase of announcements will rise to 25% in 2019 and the President has also threatened to include a further $267bn worth of goods if China retaliate, which would broadly amount to the total value of US imports from China in 2017. We think that negotiations are likely to be protracted and may well extend beyond the mid-term elections, especially now the President alleges that the Chinese are trying to influence their outcome. Nevertheless, we’ve already seen the Chinese enact policy measures to support domestic growth, while the devaluation of their currency has increased competitiveness. It is also worth remembering that as they are essentially consumer taxes, the tariffs are stagflationary for the US; they risk slowing investment and ultimately growth, whilst generating inflation. Markets aren’t currently attributing much probability of disruption to corporate America – despite the potential risk that supply chains will be disrupted by the policies. Hence, we believe that the worst is behind us when it comes to relative emerging market returns. Notwithstanding a further strengthening in the US dollar, strong fundamentals and attractive valuations support owning EM assets across our higher risk portfolios. This is especially true if momentum in the US begins to fade.